For many Muscovites, this past weekend was nothing out of the ordinary. 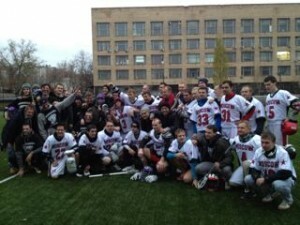 For a few, however, Saturday marked the third annual Russian Lacrosse National Championship. Aptly named “The Capitals Cup,” last Saturday’s encounter was between Russia’s two fiercest rivals: Moscow and Saint Petersburg. These rivals are, in fact, the only two teams in all of Russia. Founded almost simultaneously three years ago by expatriates, American students, and their intrigued, sports-savvy Russian colleagues, the Moscow Rebels and Saint Petersburg White Knights have since met bi-annually. Last years match resulted in a win for the Knights, so the Trophy Cup exchanged hands last weekend as the Rebels secured a 12-7 victory. At least that’s what we think the score was. Last weekend’s game occurred on a waterlogged, smaller-than-regulation sized field and was refereed by expatriates with a limited understanding of the game. In fact, only one of the two referees was actually provided a whistle. Due to these setbacks, there were times when I doubted we were actually playing lacrosse; at points, the game resembled American Football with a Slip ‘n Slide twist thrown in. From time to time, however, both teams managed to overcome the circumstances and played with incredible knowledge of the game, skill, and finesse. Last Saturday’s game was truly a sight to behold. Our Muscovite Rebels outnumbered expat teammates by nearly three to one. Our ranks have been filling quickly as Russians can’t seem to get enough of this dynamic sport. Due to the fact that most of our newcomers had never seen a real game played, an American majority squad started the match to gain an early lead and exemplify lacrosse in a real game setting. Within minutes of the first whistle, however, a Russian from the Moscow team put the first point on the board, setting the tempo for the rest of the game. The Rebels gained an early comfortable lead of 7 points by half time. At the start of the second half, our American goalie suffered a chin injury, requiring a trip to the hospital. Kirill, our very inexperienced Muscovite substitute, was brought in and more than stepped up to the challenge. In fact, half way through the third quarter, many of our Russian newcomers stepped up to fill our tired ranks and were flying up and down the field, making game-changing plays. Finally, the friendly match ended in favor of the home team. The White Knights handed over the cup to the victorious Moscow Rebels, and fans and players alike took photos to mark the occasion. This was the last game for David, our coach, main organizer, and founder of the team. As he is moving to Kiev, Ukraine for work, he hopes to find a similar community there and help lacrosse spread across Eastern Europe. I discovered the Moscow Rebels one day as I jokingly asked myself whether there was a lacrosse team in Russia. Walking to my apartment one day early September, I googled “Russian Lacrosse” and, much to my surprise, I found the Rebels. Here it is crucial to note to fellow Dickinsonians, especially those endeavoring to study abroad, NEVER underestimate the power and unlimited possibilities of simply introducing yourself to complete strangers! I have so many new friends and possibilities to practice my Russian because I wrote the team on Vkontakte (Russia’s social networking system), out of the blue, and they were more than welcoming. Don’t be bashful; Russian is a particularly difficult language and this can often inhibit making friends early on in your abroad experience. Just put yourself out there and you will be glad you did! Playing lacrosse in Moscow has improved my Russian immensely. Leading drills in practice has helped me solidify my understanding of verbs of motion and commands. Water breaks have helped me pick up on the day-to-day slang and, naturally, spending so much time with Russian teenagers, I have managed to pick up some of the worst swear words one could never learn in the classroom. Finally, playing lacrosse in Moscow has improved my confidence while speaking and given me a deep appreciation for what a rich language Russian truly is.